Outfit your drumset with a professional cymbal stand. Lightweight yet extremely sturdy the CB700 straight cymbal stand is just the ticket. zZounds is an authorized dealer of Pacific Drums products. Sound: none Feature: this is not a heavy stand, legs are double braced but short. Ease of Use: set and go Quality: the screw for thelegs has striped out in less than a year. I have yamaha stands that are 9 yrs old and work perfectly. spend the extra and get a good quality stand. If your a beginner this will do fine but not for working musicians. 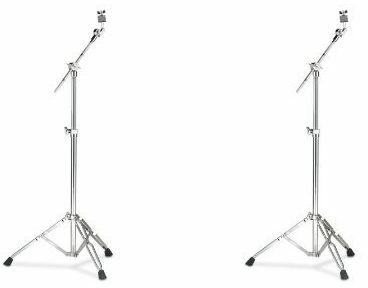 Value: If you are a drummer who rarely move your equipment this is your stand, if you play out get something else The Wow Factor: Do you need a cymbal stand? Overall: Cheep stand ,OK quality. I only recomend this for beginners. "Light construction - only for smaller cymbals." Feature: Not what I was expecting. Ease of Use: It folds up quite nicely and in a very small size so it is great for traveling. Quality: I was expecting a little heavier duty construction and this is probably among the lightest/cheapest boom stands out there. For a small splash or crash, this will probably fit the bill, but nothing larger than a light 16" crash. Value: Not terrible for the money.